During 19th Century fairs were popular attractions, held over a number of days, they drew large crowds. People paid to see deformed animals and freakish living people, hawkers would gather to sell cheap goods, clothing and sweets, and it was an event at which men and women could freely mix. Tunes like 'The Country Fair' romanticised these fairs and focused on the fun and enjoyment that was to be had. 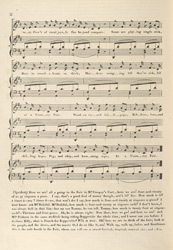 Audiences received songs about leisure activities positively, especially if they had had some experience of the subject themselves and could therefore understand the innuendo of the performer.